Elisapee Ishulutaq’s drawings of men hunting seals, women caring for babies, and polar bears out on a jaunt are simple and striking. In 2014, she received the Order of Canada, and David Gutnick produced this documentary about her work. Ishulutaq died on December 9, 2018 at the age of 93. This documentary first aired in June 2014. Elisapee Ishulutaq died December 9, 2018. From the time she was a little girl, Elisapee Ishulutaq knew what do with a sealskin: scrape it clean, measure it up and then — with a bone or metal needle — sew it into kamiks, comfortable and warm waterproof boots. In the 1930s, she and her family lived off the land on Baffin Island. 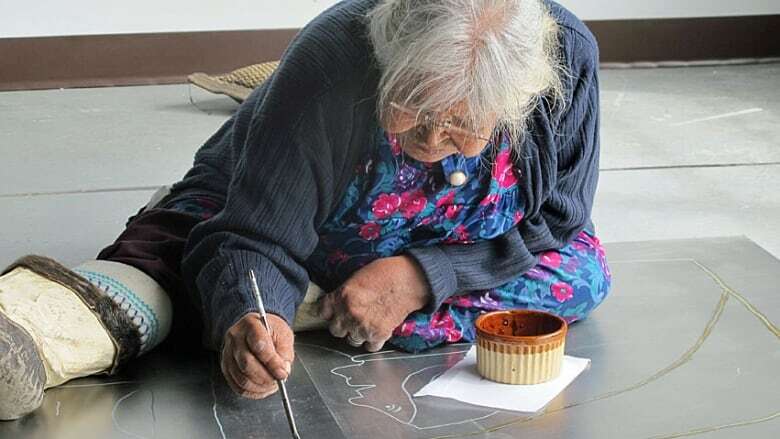 In the late 1960s, when she was in her 40s, she moved to Pangnirtung, picked up coloured pencils and her life changed. She spent hours hunched over sheets of paper, drawing what she saw around her — men hunting seals, women caring for babies, polar bears out on a jaunt. Her images are both simple and striking, almost dreamlike. Some are no bigger than a sheet of foolscap. Others like, Nunagah ("My Home Place"), which is at the National Gallery in Ottawa, cover entire walls. Ishulutaq was among the first Pangnirtung artists to make prints, and over the decades her art has helped define how the Inuit are seen around the world. In 2014, in her late 80s, she was appointed to the Order of Canada. She also visited Montreal to work with master fine art printer Paul Machnik in his studio. 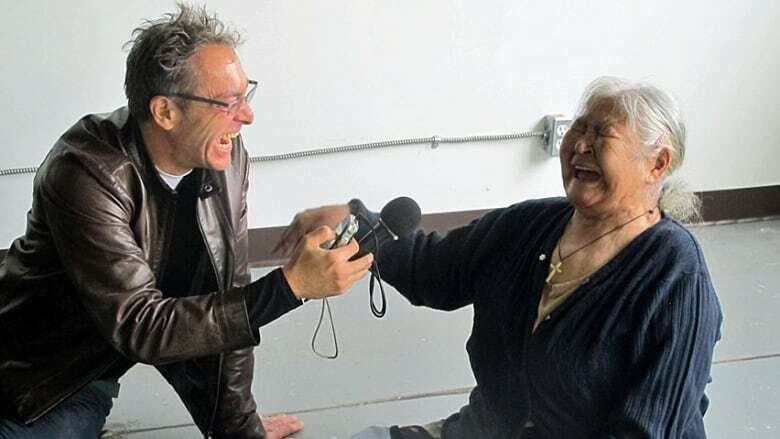 When David Gutnick met her there, Ishulutaq's wheelchair sat abandoned by the wall. 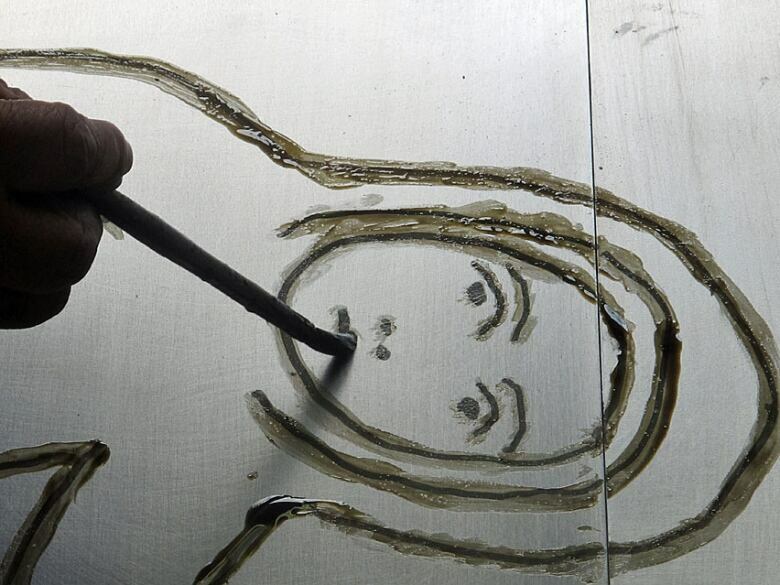 She was on her knees on the cement floor, a paintbrush in one hand and a coffee cup in the other. A delicate cross carved from a walrus tusk hung around her neck, and her eyes were closed, as she sang a playful song she had learned as a little girl. 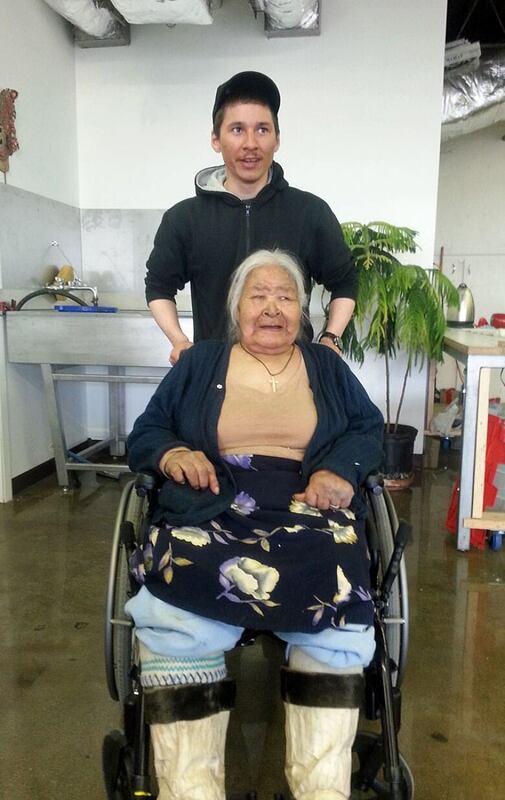 Her grandson Andrew Ishulutaq interpreted, as his grandmother only spoke Inuktitut. The song itself stemmed from those long, dark winters years ago when Ishulutaq's family lived in an igloo, the only light coming from the flames of seal oil, burning in soapstone lamps called qulliqs. She and the other children amused themselves by tossing a caribou skin ball back and forth for hours on end. That happy memory is what the artist was working on all morning: turning a song into a printed image that would last forever. As she dipped her brush into a sugar solution and painted away on a metal plate, Paul Machnik stood at a table a few metres away, wiping ink over another plate. Machnik was making sure every one of Ishulutaq's brush-strokes was well-inked before the plate and a sheet of damp paper were wrapped in felt and run through the press. The two first met in Pangnirtung in the mid-1990s, when Machnik went North to give some workshops. They sat and drank cup after cup of sweet tea, as Ishulutaq​ patiently schooled him about her life in the far North. "She treated me like a son," said Machnik. "The older folk are looking at who you are, not where you are coming from or what you are wearing. It is a deeper sense of communication." In her talks with Machnik, Ishulutaq spoke about beauty, and about the devastating consequences that followed when federal authorities moved nomadic Inuit off the land and into settlements, so they were easier to monitor and control. That schooling continued in Machnik's studio, as light streamed in the windows. "Elisapee spoke yesterday about how the dogs were shot, and they were told they had to live in the community and therefore were restricted to that environment," said Machnik. "She spoke about her father having to struggle to fetch seal in the middle of the night, it got so bad the whole community was eating sealskin, they were that desperate." Ishulutaq​ was on the floor for more than an hour, outlining the walls of an igloo. The face of a very serious-looking little girl was complete and a tossed caribou-skin ball was suspended in the air. Filmmaker Sylvia Safdie was also present that day, training her camera on Ishulutaq's face, hands and paintbrush. "I see such deep emotions from one moment to the other," said Safdie. "Here is a woman who has lived through so much, and it is in her face. It is the way her eyes move, they light up and then they become sad." Safdie was trying to capture images about something that Ishulutaq​ had that was fleeting, almost invisible. "She is not functioning in theory," said Safdie. "She is functioning from within, and that is the essence of art. For me that is a gift, to be able to really observe her working." Ishulutaq​ looks up from her painting — of another memory. "My grandfather used to play the Inuit violin," she said. "Nobody plays it anymore. So many people would be up on their feet, dancing." "She is leaving her gesture, her hand," added Machnik, who said that it is not just the images themselves that are important, but that they are also a kind of statement: "I was here, my hand did this and I wanted to convey that I was alive and I lived like this. We had a good life." Click "listen" above to hear the documentary.